Is Your Business Ready For ISO 9001 Certification? 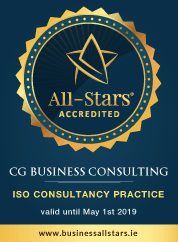 Your organisation could benefit from a FREE ISO 9001 Consultation with CG Business Consulting. ISO, the International Organisation for Standardisation is an independent, non-governmental organisation, the members of which are the standards organisation of the 163 member countries. It is the world’s largest developer of voluntary international standards and facilitates world trade by providing common standards between nations. Nearly 20,000 standards have been established covering everything from consumer products and services, construction, engineering, business, information technology, human services to energy and water utilities, the environment and much more. Use of the standards ensures that products and services are safe, reliable and consistently perform the way they were intended to. Standards are published documents that set out specifications, criteria and guidelines designed to ensure that products, services and systems are fit for purpose and of good quality. Standards are developed by a group of industry experts and are based on sound industrial, scientific and consumer experience and are regularly reviewed to ensure they keep pace with the business world and new technologies. ISO standards enable products from different markets to be directly compared, they facilitate companies in entering new markets and assist in the development of global trade on a fair basis. They also enable companies to access new markets and tender for public contracts. The standards help businesses increase productivity while minimising errors and waste. They also serve to safeguard consumers and the end-users of products and services, ensuring that certified products confirm to the minimum standards set internationally. ISO standards enable companies to work more efficiently and effectively. They are a tried and tested way and helps over a million companies worldwide to improve their performance, reduce their risk and help them be more sustainable. Make sure your products and services consistently meets customer requirements and your company pursues continuous improvement. Contribute to a more sustainable world by protecting the environment, by preventing pollution and negative environmental impacts and improve your environmental performance. Improve confidence in your food products with this harmonised food safety management system, benchmarked against international best practices. Formalise energy policies and objectives and embed them into energy efficient thinking throughout your organisation. Improve sustainability throughout your entire event management cycle with this standard. Follow information security best practices to protect your data and ensure that your organisation’s confidential information is secure. Maintain a safe workplace for your employees, contractors, suppliers and visitors.